Switzerland’s top private bankers are convinced they can avoid a damaging witch-hunt over their activities by U.S. authorities, in the wake of UBS’s tax row. In interviews with the Financial Times, senior executives of Credit Suisse and Julius Baer, the country’s number two and number three private bank businesses after UBS, both said they were sanguine. The comments came shortly before Éric Woerth, France’s budget minister, claimed in media interviews on Sunday that the authorities there had gained access to 3,000 client names. “We took measures a long time ago and established clear rules,” said Walter Berchtold, head of Credit Suisse Private Banking. “From that point of view, I’m very comfortable.” Boris Collardi, chief executive of Julius Baer, said: “I don’t want to say we’re relaxed but we’re prepared. There may be some requests for information [from tax authorities] but I don’t think we face the risk of another John Doe summons.” The banks were speaking after an agreement this month between UBS and the U.S. authorities to settle a long-running tax dispute involving the unprecedented hand over of 4,450 secret client names. 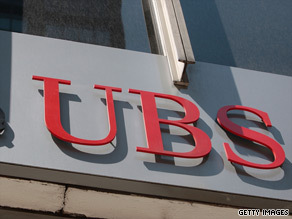 As part of their action against UBS, U.S. authorities took legal action allowing them to pursue unidentified targets, via a so-called John Doe summons. The affair has prompted fears in Switzerland that other private banks could come under attack from tax authorities in the U.S. and beyond. But Julius Baer struck a defiant note. “It’s like we’ve been driving in a 60kph zone and after you’ve passed it, someone tells you it was 30. The interpretation of the rules has changed,” said Mr Collardi. “It’s a very unpleasant position to be in, but the most important thing is that we won’t compromise on fishing expeditions or banking secrecy.” Mr Collardi said he was confident the Swiss government had a roadmap in place to deal with further legal challenges. The Swiss government, which helped broker the UBS deal, has attempted to limit the damage to the Swiss financial industry by arguing it was a one-off case. However, the complex agreement also allows for similar actions against other banks, though the precise criteria have yet to be disclosed. The US clampdown has been closely watched by other countries seeking to crack down on suspected tax evasion. In Canada, where UBS was also very active in pursuing offshore customers, the authorities will meet bank officials later this week. Copyright The Financial Times Limited 2009. You may share using our article tools. Please don’t cut articles from FT.com and redistribute by email or post to the web.